Depending on the season and Location $45-$60 a day is not very expensive. Sure you can find cheaper ones, but it is not hugely expensive. And paying 2 days upfront is normal for any european country, including east-europe and Russia. Even our ski-resort in Austria asks me to pay part upfront for reservation. I also have to agree with Chris, that doing without a Translator as soon as possible is the best way to go if your serious. Most mobile smartphones based on Android and iPhone can access google translate. Free WIFI is everywhere in Crimeas beautiful cities. Just pick a restaurant that has one. It may even be awkward to use a real Translator if things progress as you both hope. My wife and I used only a Russian/English dictionary on first meet, nothing more. my Nexus 7 lets you talk into it in English and talks back to you in Russiabn, and visa versa. It fits in my pocket so I can take it anywhere and cost you nothing to use. Its got be be a better option than paying for a 3rd person to translate for you, and chances are it will do a better job and will be much more fun !!!! Sorry been late to the party but I was very busy at the weekend and I just read the whole thread, about your forthcoming trip to Crimea to meet your friend Elena. Markje gave you a very good advise, so far, and I agree with everything he said as he knows Crimea better than us. In my view, staying in an apartment is the best idea, because gives you the freedom, to come and go as you please, offers more privacy and less restrictions and that way you can get to know your prospective woman much better and more intimate without any restrictions. I guess you will be flying to Kiev first and then connection to Simferopol. There you will need a private car or taxi service to meet you and transport you to Sevastopol and I guess your woman's friend can organise that but be careful with the cost. Personally always like to organise everything on my own, ask for two quotes for the cost and finally prefer to have control of the whole situation and my needs. The use of a translator, initially, is good idea to settle down but then, as other's said, you should use an on line translator, like you probably do right now when talking to her on Skype, otherwise how you would get to know each other better, and as Chris said more fun and less costly? Whenever I travelled to Ukraine, always I had a back up plan and taking the info of Chris with you is advisable, because you never know what might happen. After all he is an English man and can get you out of a difficult corner, if you need it! 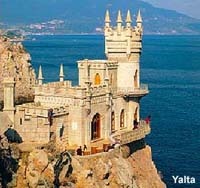 Small suggestion, make sure you hire a driver to take you around Crimea for the day, so you can see as much you can! Travelling so long way to meet one woman, it is a little risky because if she doesn't like you, leave you and go back home, what are you going to do? Of course we all wish you to have a nice holiday time down there and let us know how it all went, later when you are back home! My flight will be through Istanbul. Not the way I would like to go but that is the way of things. This flight was half of what others cost. The kind of advice I was looking for was more along the lines of how best to protect myself from both danger and doing something stupid. Like, should I wear a money belt? Do I need those holders that protect your credit card from being read? Are there certain clothes that I should not wear? If I understand correctly shorts are frowned on? Bright colors are also not a good idea. As for Elena and I... We began talking back in December, and even then I told her that with my job I would be busy and not able to travel until April. This has given us a lot of time to talk and chat online, share pictures, thoughts, and even have a few disagreements. Yes I know it is chancy to only visit with one woman, but I am going to keep my fingers crossed. It is funny... the translator has said pretty much the same things as all of you. That she is there to help ease us into things and that we will have to decide when we get there how much we will need her. I have emailed Alla with questions and she has given me some very good suggestions. Things like to go to the bank here and make sure they know I am traveling to Ukraine so my cards don't get blocked from use. The one thing I am absolutely certain of is that I will be surprised. I would avoid having much cash on yourself as a person. Therefore no money belt is necessary as your spare cash fits in your wallet. Use the Credit-Card at ATM's for those rare occasions that you have a restaurant that won't accept a CC. You shouldn't need a holder either, Criminals there are low-tech. 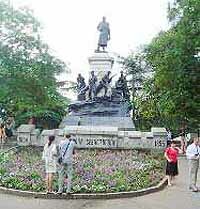 As for clothing, the Crimean peninsula is very close to the Equator so warm weather is to be expected. I would pack shorts for a hot summer day, but also some longer pants for restaurant occasions or cold weather (if you have bad luck). Any clothes that do not scream "tourist" will basicly do fine. The women sure appreciate this method. I used it 3x and liked it far better than having more than 1 woman to visit in 1 vacation. Just keep the address of a local dating agency handy in case your trip is a total bust. I would just keep the translator at bay and use her as minimal as possible. Possibly only for checkins at hotel, etc. Elena had to take a week off from work in order to attend her godmothers funeral. She is finally home and I just got off skype with her a few hours ago. I asked if she would still be able to get time off from work. She said she could it was all arranged. The week she takes off to see me will be unpaid time. I feel really horrible about this. And just so you all know, she did not tell me this. I asked. And she did not ask for any money either. I imagine this is probably the normal for working in Russia. I just feel terribly that it has to hurt her financially. If we do get along and I think we will, I will be sure to help her out.